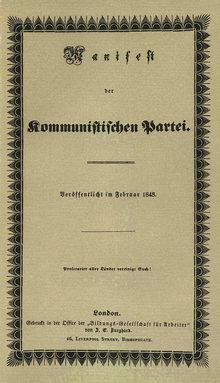 The Manifesto of the Communist Party (German: Manifest der Kommunistischen Partei), more commonly known as The Communist Manifesto, is a short book. It was written by the German Marxist political theorists Karl Marx and Friedrich Engels in 1848. The book was originally written in the German language. Since it was first published, it became one of the world's most influential and controversial political manuscripts, and has been translated into many languages. The book is about analyzing approaches to class struggles (from both the past and present), and problems with capitalism. The book does not talk about or predict how communism would be in the future. It is a mixture of both Marx and Engels' theories and opinions on society and politics. It also has their written ideas of how the capitalist society of their time would be replaced by socialism, and after that, communism. Especially by the abolition of private property and child labour and by making means of production common, strong progressive income tax and free education for all. The manuscript of the book is registered in the Memory of the World Programme together with the volume I of The Capital by Karl Marx in June 2013.